The current facility includes 3 hard courts with lights. 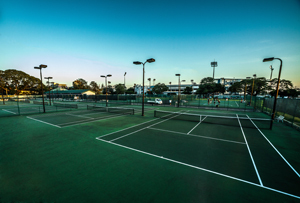 The tennis courts are occasionally used to host tennis tournaments. The complex offers parking facilities, a cafeteria, restrooms and changing facilities. The facility includes six standard tennis courts, one international grade tennis court, one netball court and one basketball court. The tennis courts are occasionally used to host tennis tournaments. The complex offers parking facilities for 15 vehicles and a single- storey building comprising a cafeteria, three offices, restrooms and changing facilities. 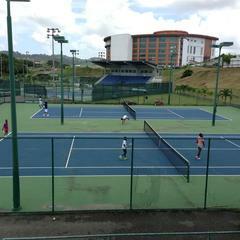 The facility includes 2 hard tennis courts. 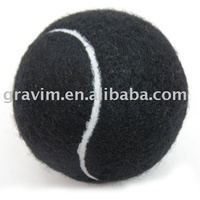 The tennis courts are occasionally used to tennis clubs in the area. Street parking and limited bathroom and changing facilities. The facility includes eight hard tennis courts. The tennis courts are occasionally used to host tennis tournaments. The complex offers parking facilities restrooms and changing facilities.